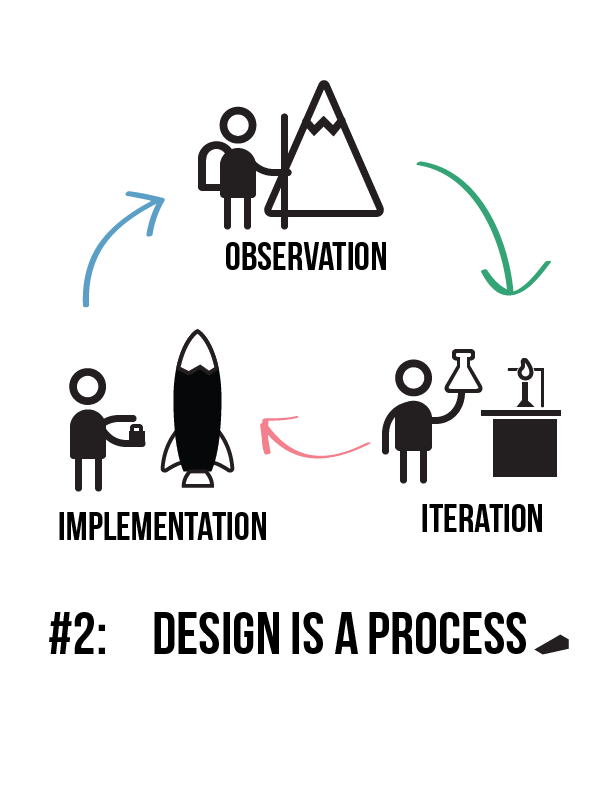 The genesis of the design process is a problem. We want to start off with only a problem in mind; starting with a solution can blind you to potential, better solutions to the problem. We then go and find out who is affected by the problem right now. What are they currently doing to solve the problem? What potential resources do they have access to? And most importantly: do they actually want to change what they’re doing right now? Don’t think for a second that you know what your user wants. 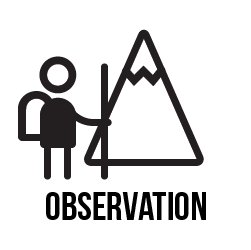 As an observer, you should watch the user in their environment and see what they do. Right now is the time to ask questions and sit back. You’re not here to tell them anything. A good sign is if they’re doing more talking than you are. Now we enter into the stage of idea generation. We want to use this opportunity to explore as many possible solutions as we can. You want to put in as little time as possible to get to a stage that you can get feedback. Build things out of cardboard, make paper mockups, run mini experiments. The faster that you can validate your ideas, the better ones you will have. In the early stage of the iterative phase, you don’t want to dismiss any ideas. In fact, the wackiest ones can often lead to the best solutions. We try and cultivate crazy ideas because they can often be jumping off points for realistic solutions. After we’ve explored many ideas, we use the constraints we’ve received and noticed from our observations to refine our ideas down to key and crucial points. Constraints can be incredibly helpful; nothing is worse than having a blank canvas to work on. 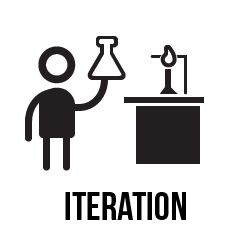 Then, we work iteratively: we build a prototype, get feedback, and then rebuild until we’ve reached a solid solution. 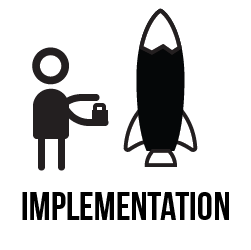 Before implementing our solution we like to find out what the measures for success are. Are we trying to drive more website traffic? Improve posture? Increase the number of new businesses in a neighborhood by 30% over five years? We can’t know if our solution works unless we have a way to measure. After we have a good solution, the most important thing to do is to actually put in place. This means actually building what we’ve thought up. I like to think that designers are special in the fact that we can come up with solutions and actually build them, but the best designers know when to hand over the solution to someone who can do it better. There’s no such thing as a perfect design. You have to reassess often and never feel afraid to go back to an earlier stage and start again for a better solution. So, designers aren’t just people who can build flashy websites and make pretty looking chairs, we’re thinkers and problem solvers at our core. And hopefully we can come and solve a problem you’re having, too.